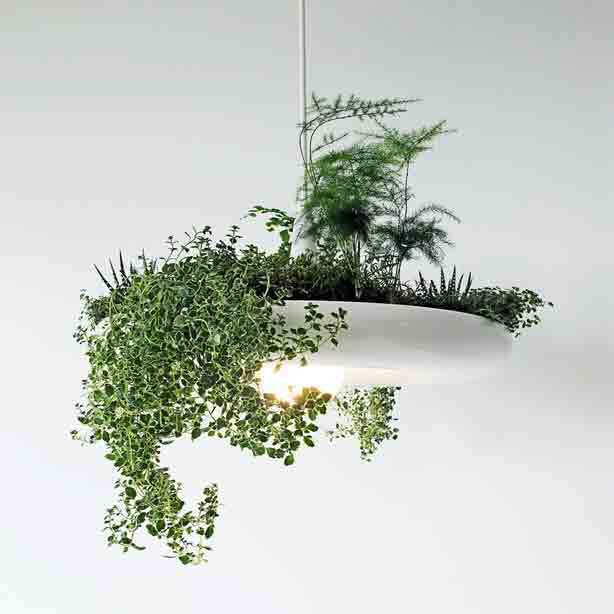 We’ve found some planted light fixtures that not only demonstrate imagination and ingenuity, they save space functioning at once as lighting and planters while also filtering indoor air. 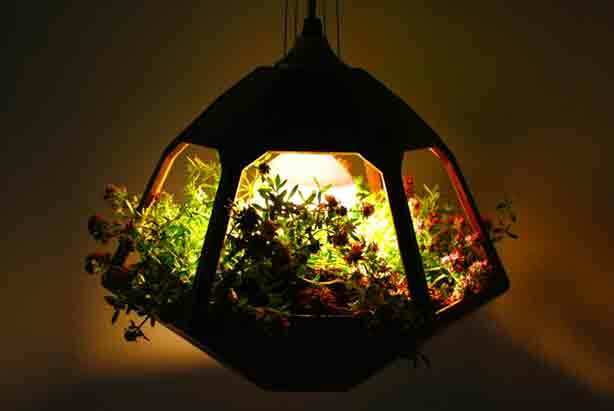 The light these fixtures emit provides the needed illumination required for indoor pants to thrive so even sunlight deprived spaces can enjoy a bit of indoor gardening. 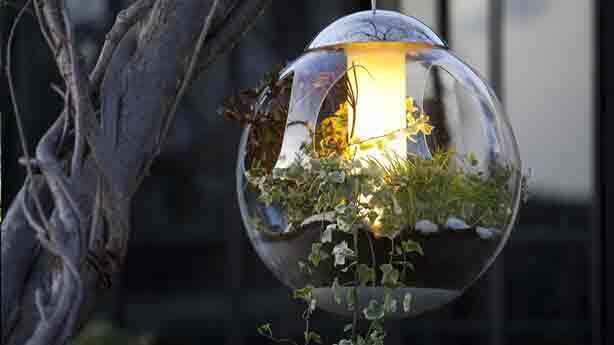 garden that can be an organic illuminated focal point or a working herb garden over the kitchen counter, or both. 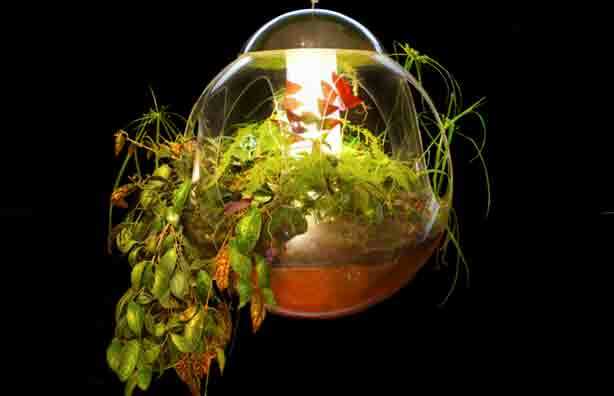 No matter where it’s situated, Babylon will become your very own hanging garden. Find it here. 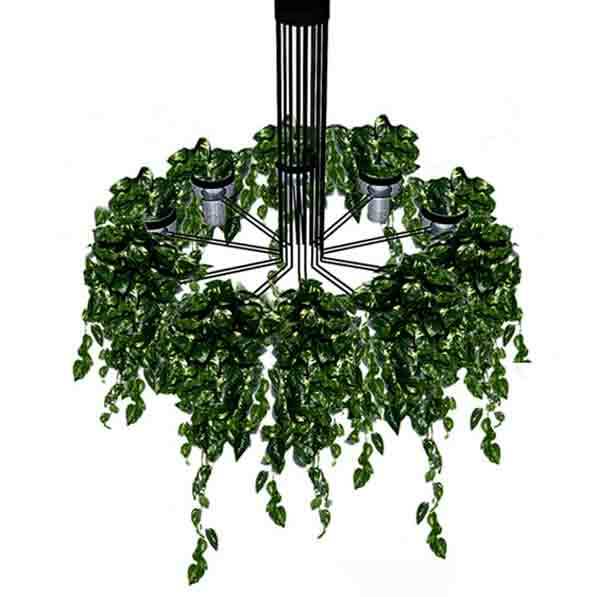 Ever since 2007 when he designed the scenery for “Folies Végétales,” an exhibition dedicated to Patrick Blanc, known for his vertical gardens, French designer Alex Tricoire has continued to design with plants. 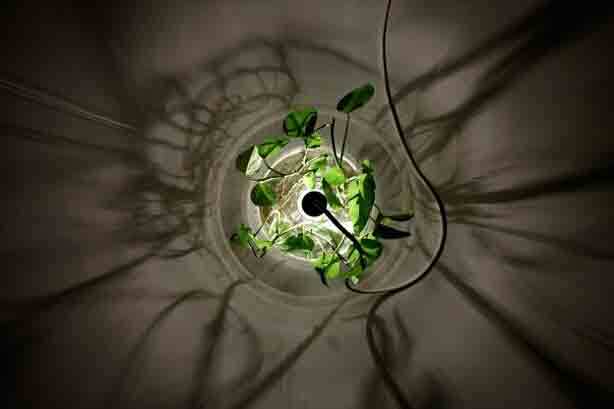 In 2009 he launched Végétal Atmosphère (Plant Atmosphere), a prospective studio laboratory for plant-based designs for which he created Babylone, above, the spherical plexi-glass pendant light planter we featured recently in our coverage of Stockholm Design Week. Tricoire is also the creative mind behind some planted pillows for Art Terre which we showcased a while back. Find it here. 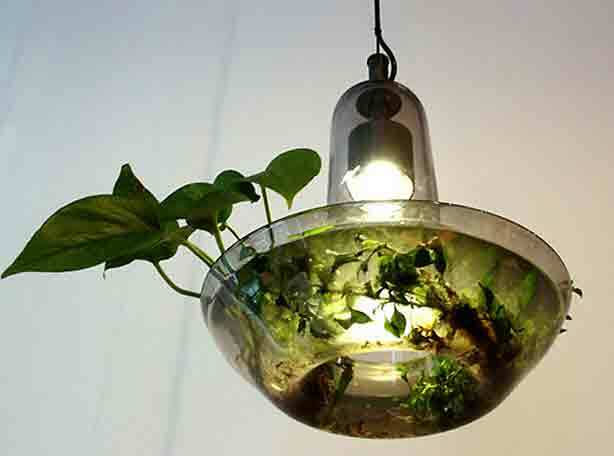 Each Grow Light Pendant by Caleb Siemon is unique, designed for those with limited light, space, or outdoor temperatures who crave bringing something earthy to their interior surroundings. 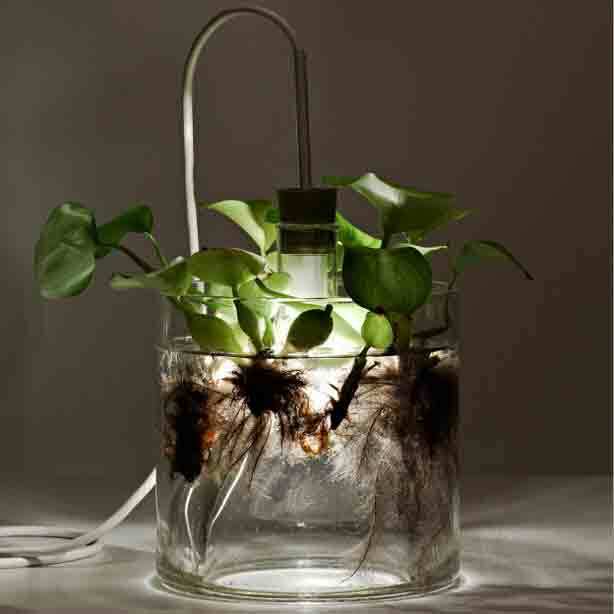 Especially well-suited for epiphytes, fresh herbs, and succulents, the hand-blown lead free crystal glass clouds the LED bulb to diffuse the light. Find it here. 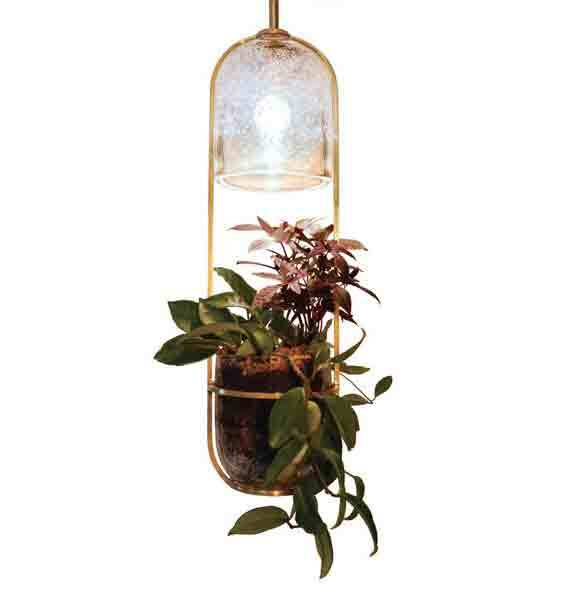 The limited edition Vicky Lamp designed Netherlands-based studio Jose de la O, is both a hanging terrarium and a Victorian-style light. 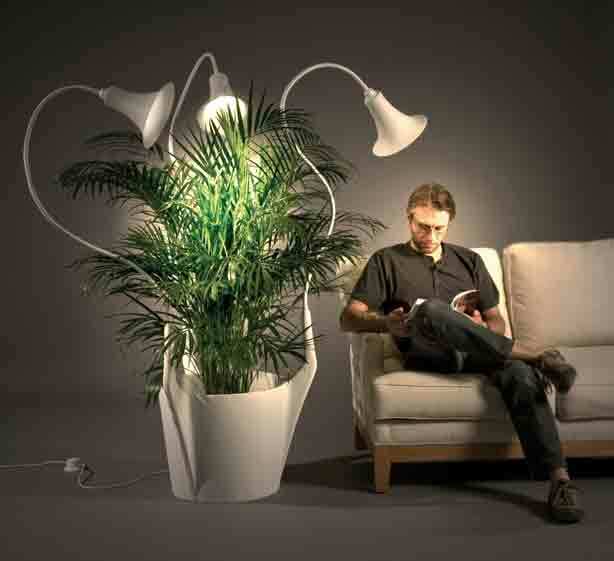 It uses a special bulb that provides an increased radiation on the blue spectrum, helping plants thrive. Find it here. 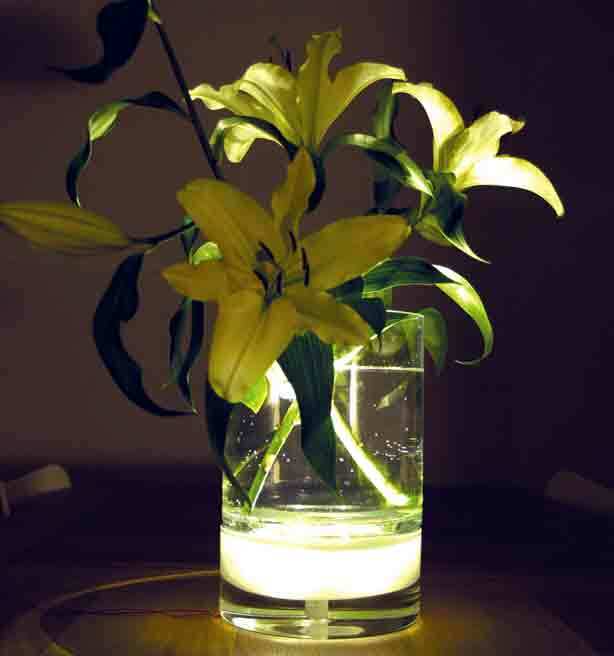 Known for their illuminated planters and cordless outdoor lights, Bloom Holland’s mouth blown glass two piece vase is illuminated by a strong led light in its base which casts a warm glow perfect for tabletop or as an accent piece. Find it here. 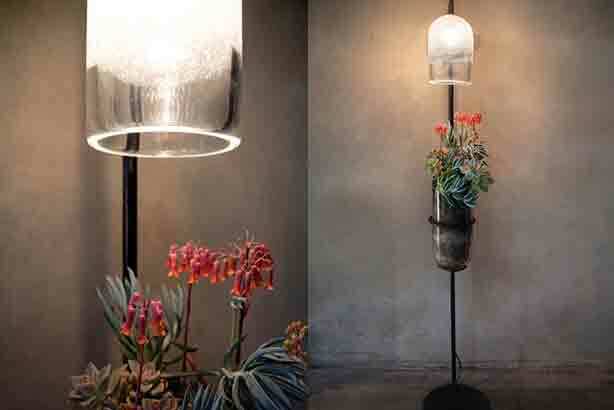 Debuted in 2009 at Salone Internazionale del Mobile, Gumdesign‘s Flora metal and glass plant chandelier for Italian lighting brand, TrediciDesign, contains Floraset bulbs by Osram, providing the spectrum of light needed for photosynthesis. 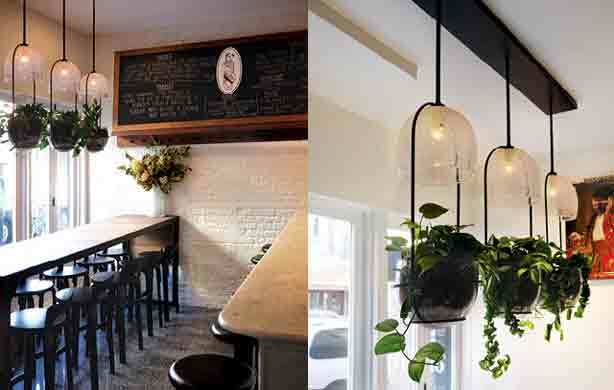 The light projects down the fixture’s center, spreading strong interior illumination while also providing necessary light for the plants in glass pots at the end of each branch. 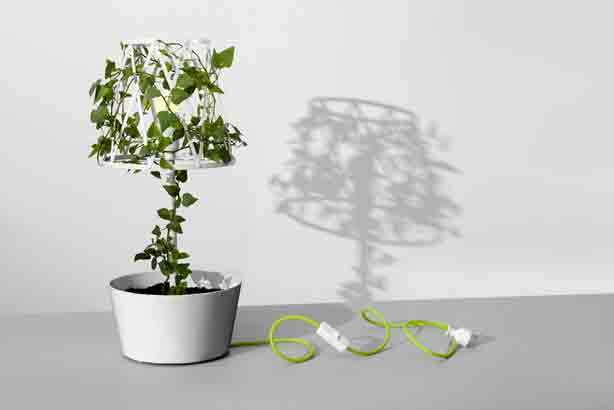 Siesta Studio’s design for its combination lamp and flower pot also functions as a trellis to train climbing vines. 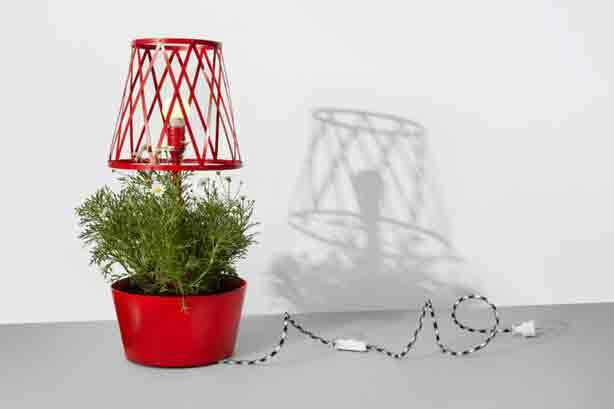 The Green Lamp fixture casts shadows producing a play of light that continuously changes. Find it here. 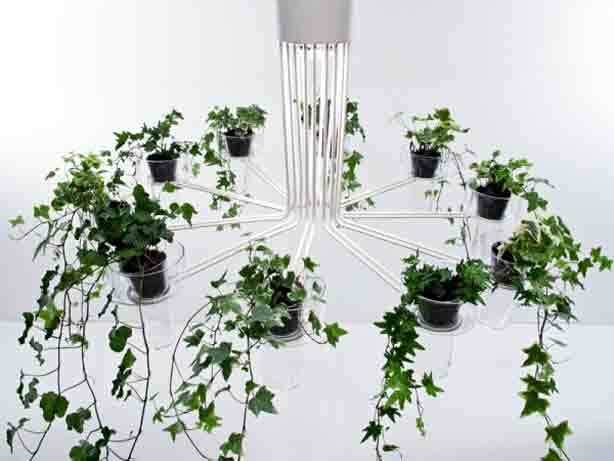 Natalie Jeremijenko’s carbon-neutral Green Light for the 2009 Haute Green fair, below, is a planter and lighting system with an integrated solar panel to power its LED bulb. 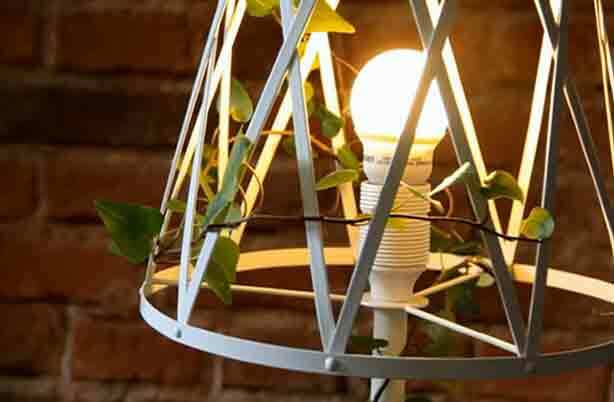 With all recyclable parts, Green Lamp is a three-way win as solar panel power’s the the bulb that stimulates the growth of air filtering plants to improve indoor air quality. 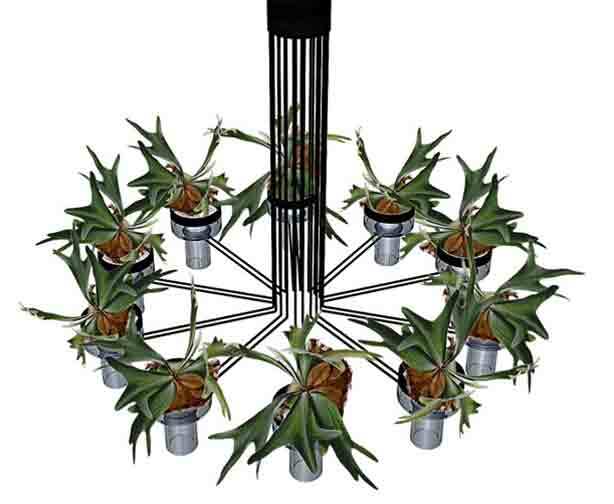 ENSAD student Caroline Schilling’s diploma project resulted in this concept for a large indoor planter, below, that also supports several flexible lights.